While most attention paid to professional armed forces like Canada's concentrates on issues surrounding the use of force (war), these forces have numerous other important national functions. Among these are their use as a tool to advance other national political and social goals, reinforced by the importance of ensuring that the Canadian Armed Forces (CAF) reflect and represent Canadian society as a whole. This presentation examines the evolution of government attempts to advance national social goals, including bilingualism and diversity, through the CAF, and the resulting dilemmas as a function of the clash between social goals, and military requirements and efficiencies. James Fergusson is the Director of the Centre for Defence and Security Studies, and Professor in the Department of Political Studies at the University of Manitoba. During the 2016 summer term, he is the Trier Centre for Canadian Studies' Visiting Professor, teaching classes at the U of Trier, and collaborating with the IRTG Diversity. 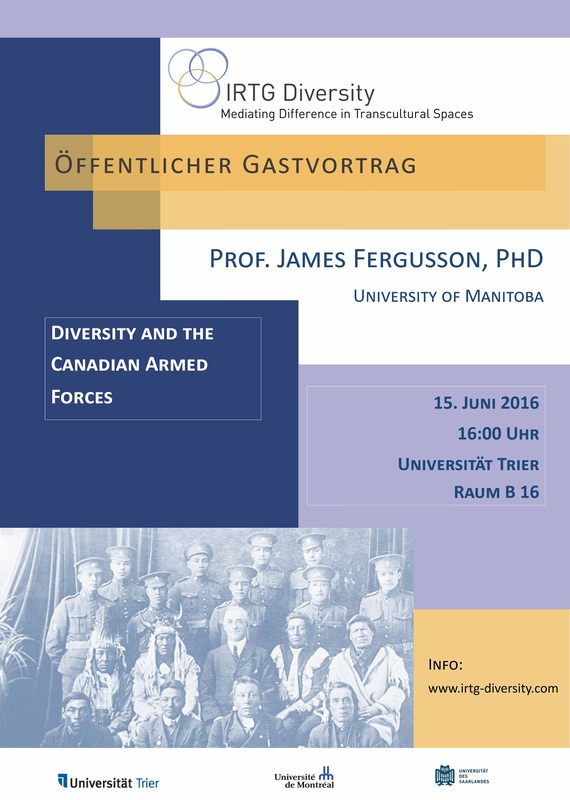 James Fergusson's guest lecture on "Diversity and the Canadian Armed Forces" will be taking place on June 15, 16h, in room B 16 at the U of Trier.